The continuing power crisis in Kumaon has now been compounded by water scarcity. The supply of water has been badly hit because of power roasting. Water could not be supplied to the residential colonies as it could not be pumped in the absence of power. The Kumoan region, despite incessant rains, has been in a festive mood. Aanthon and Hiljatra in the Sour valley, the festival of Nanda Devi in Almora, Ganpati in Haldwani and Jhumadhuri festival in Lohaghat were attended by thousands of devotees. Bollywood actor and Padma Shree awardee Tom Alter’s dharna for 12 hours on the issue of Clock Tower demolition in Mussoorie got support from all residents who have been hurt by the whole demolition exercise. 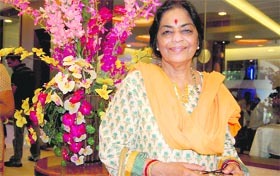 The Nationalist Congress Party (NCP) Uttrakhand has started bracing itself for the state Assembly election due in 2012. The party held a meeting with the Rashtravadi Yuva Congress, Rashtravadi Mahila Congress, Rashtravadi Kisan Congress, Rashtravadi Sainik Congress and Rashtravadi Chhater Congress on Septemebr 14 at party headquarter in New Delhi to discuss the strategy for the coming election. The Supreme Court has confirmed the death sentence awarded to Sunder Singh from Bageshwar district for killing five members of a family by setting their house on fire due to a land dispute. The Nainital High Court has ordered the state government to reinstate former SP (City) Jagat Ram Joshi at the same post. The High Court today revoked the transfer order of Joshi. Taking cognisance of a large number of quacks practising in Lal Kuan and Haldwani along with medical establishments administering medicines that they are not authorised to give to people, the district administration has started action against the culprits. Members of the Gram Pardhan Association, Uttarakhand, continued their protest pressing their pending demands on the administration outside the Vidhan Sabha here yesterday. Three more gram pradhans from Champawat district reached here today supporting the agitators in their cause. The Civil Court (Senior Division) has passed an injunction order regarding the property Baring Institute, popularly known as Living Literature Centre, worth several crores, located near the Rialto cinema, directing the involved parties not to sell, transfer or construct it till further notice. A total of 28 pilgrims, including nine women, of the returning 15th Kailash Mansarovar Yatra batch were stopped for six hours at Pangla near the Dharchula base camp by Bharatiya Kisan Sabha (a farmers’ wing of the CPI-ML) workers, who were demanding appointment of teachers in local primary schools. The CPM apprised the State Transport Authority (STA) about the anger seething among people over the hike in the rates of shared autos, city and private buses. An awareness campaign to save petroleum products (PCRA) was held under the aegis of petroleum Conservation Research Association and Society for Ecology (SEWA) and Water Afforestation in an institute at Mussoorie today. Several documentaries were shown to the students to make them understand the need for petroleum conservation. MIt was shown that by saving fuel they could also saving money. The region, including the important towns like Nainital, Kashipur, Rudrapur and Haldwani, is reeling under a severe power crisis because of a breakdown in a 220 KV power line coming from Bareilly to Kamluvaganja. One of the towers on this line was struck by lightning on Wednesday rendering it useless. For now, power is being provided with the help of a 132 KV line coming from Bazpur. Since this line cannot take much load massive power cuts have been undertaken. Even places like Nainital are going without power for more than 12 hours. The situation is no better in Haldwani, Rudrapur and Kashipur while it is much worse in the rural areas. The industrial hubs in Rudrapur and Sitarganj are the other major sufferers as production has been badly hit because of water and power crisis. Officials say that it will still take three or four days for the power supply to come back to normal. The problems on account of the continuing incessant rains across the region continue to be aggravated. With the water levels in the seasonal streams and perennial rivers continuing to rise, new areas get inundated every day, particularly in the Terai region. The vehicular movement across the region continues to be badly hit with more roads getting blocked because of landslides, mudslides and rock falls. The supply of essentials in the remote villages and settlements remains a major challenge for the administration. There is no respite from the rush of patients in various hospitals and health centrrs in the region. Fresh cases of dengue, diarrhoea, conjuctivitis and typhoid are being reported daily. The health department officials are carrying out extensive public awareness drives in the areas from where maximum number of patients are being reported. People are being told to avoid use of contaminated water and plans are being drawn out for fogging in the residential colonies. The department personnel are also distributing free medicines in certain areas. Pitthoragarh (OC): The district administration has distributed Rs 82,000 as an immediate relief to the residents of Qurie-Jimia village near Munsiyari who were badly hit by land erosion last fortnight, informed District Magistrate (DM) NS Negi. “Besides, the relief amount we have sanctioned a sum of Rs 35,000 to each house collapsed or badly damaged in the village,” said the DM. Negi said a separate fund of Rs 15 lakh had also been sanctioned for the repairing and reconstruction of drinking water schemes, schools and community houses. “The Dholi Ganga projects based at Dharchula have also distributed 450 ration packets and 45 blankets to the affected people of Qurie-Jimia,” said the DM. “This year, not only in the Malla Johar region of Munsiyari, where the Nanda Devi worship was started hundreds of years ago, Didihat and Pitthoragarh towns also witnessed the Nanda festivity, besides Nainital, Bhawali and Almora where this tradition is age old,” said Mahendra Singh Matiyani, a leading culture figure of the Kumoan region. In Didihat town, the Nanda Devi festival was inaugurated by leading cine artiste Sanjay Mishra. “The five-day festival was attended by thousands of people of different communities,” said Sanju Pant, a youth leader and journalist attached with this festivity in Didihat. In Champawat district, the traditional Nanda Devi festival was organised with bringing of banana leaves on September 13. “The six-day festival in the Champawat region has a particular identity when all local deities, which embody human, come into vitality and accompany the sedan of Nanda and Sunanda which will be immersed on September 18,” said Dinesh Pandey, a local culture activist. In Almora town, the festivity began on September 12 and on the Asthami on September 15 more than 10,000 people from Almora town and surrounding villages worshipped Nanda and Sunanda at the Nanda Devi temple. In Lohaghat town of Champawat district, more than 5,000 devotees of a local deity Jhuma gathered at the temple and attended the chariot of the goddess. “The main festival is organised at Raikote Qunwar village where the women aspiring for children keep fast and worship the goddess in the night,” said Naveen Murari, an organiser of the festival. 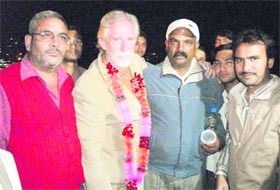 Tom Alter with residents of Mussoorie on Friday. The dharna was called off after he was offered juice by president of the Mandi Parishad Upendar Thapli late last night. The Palika and businessman Sanjay Narang had assured him that the work on the construction of the tower would begin immediately. Tom Alter was moved by the outpouring of emotions from all walks of life and after breaking his vow of remaining silent late last night said for him it was a personal and emotional moment and he did it for the love of the Clock Tower. Tom Alter said he along with his elder brother had been watching the tower since childhood and due to this bonding had written many poems and ballads in its praise. It was this attachment that forced him to sit in protest. Tom Alter left for Mumbai in early hours today. Palika president OP Uniyal said Tom Alter was misguided by Congressmen from Mussoorie namely MLA Jot Singh and former Palika president Manmohan Singh Mall. Reacting to this statement of Uniyal, Mall said if Uniyal thought like this then so be it. It seems that the hullabaloo over the Clock Tower issue will only die down after the completion of its construction. Dhayani also talked about the issues on which his party will contest the Assembly election. “The party adopted a Sankalp Prastav on June 10 according to which the party will support Gairsain as capital of the state, inclusion of native languages of the state, Garhvali-Kumaoni, in the 8th list of the Constitution, constitute Himalaya Development Authority, a separate agriculture policy for the state, enforce the projects for the overall developments of tribal languages of state, bring out concrete plan to stop exodus from hill villages and to instill a sense of security among minority communities of the state,” he said. On the recommendations of coordinator of the state Bhola Bhai Patel and subsequent approval by MP, the General Secretary and in charge of state, Govind Rao Adhik, the committees for the Garhwal Mandal and Kumaon Mandal have been appointed to discharge duty of carrying membership drive for the NCP in the state and building organisational base in the districts falling under the jurisdiction of the mandals. Manoj Dhayni has been made the head of Garhwal Mandal, and Inderjit Singh Bisht of Kumaon Mandal. Rejecting the plea for leniency, a Bench comprising Justices VS Sirpurkar and AK Patnaik said yesterday that the accused not only torched the house in the night after pouring petrol extensively when the family was having dinner but also bolted the door from outside. He also used a sword to hack a victim who, despite being ablaze, managed to come out in a bid to escape. “The murder was committed in a cruel, grotesque and diabolical manner. When all members of the family were having their food, the accused poured petrol in the room and set it on fire and went to the extent of closing the door also,” the Bench noted. Further, he was also carrying a pistol. The five victims included a 16-year-old girl and a 19-year-old boy and two women. The crime was committed on June 30, 1989, in Mahargheti village in Dangoli Patwari Circle which was then part of Almora district. He was transferred to 46th PAC Battalion, Rudrapur, as Deputy Commandant after the alleged beating of a BJP MLA in July. The state government had also removed Director General of Police (DGP) Subhash Joshi and Senior Superintendent of Police Abhinav Kumar in the aftermath of the MLA beating. Joshi’s advocate said the latter had filed a petition questioning the state government decision to transfer him before the completion two years of his tenure. The HC had accepted his pleas and had directed the government to appoint him at three places of his choice. But, the government later filed a review petition. The administration took action against a number of owners of such establishments in Lal Kuan who had been asked to furnish relevant papers. Those who could not furnish the papers have been penalised. Chief Development Officer (CDO) Deepak Rawat has ordered the closure of one such shop as the person running the clinic did not possess the relevant degree. Seven such cases were taken up by the CDO. In another case, it was found that while the establishment was authorised to collect samples of blood, etc, it could not test them. The owner was asked to give an undertaking that he would not give test reports for the samples. In another instance, an establishment owner was asked to get his enterprise properly registered. The CDO directed the officials concerned to take action against a homoeopathic outlet that did not possess relevant documents and a medical store being run by a person other than the one who had been granted the license to do so. The shops in question had been sealed by the authorities in Lal Kuan recently. The district administration has assured the people that it would not allow attempts by quacks to play with their well being. The protest was held in continuation of the meeting and dharna staged by the association in the past. Members from across the state were present to highlight the issues of the respective block or constituency. According to Mool Chand, spokesperson for the association, “The association is striving to pressurise the state government for framing a new Panchayati Raj Act in the state and increasing the honorarium of gram pradhans from Rs 600 to the respectable amount”. “The state government needs to look into the matter soon, then only the development can be attained,” he added. Prakash Mehra, president of the association, Champawat, said they would go to any extent if their demands were not met soon. The members of Baring Institute had sold the building to resident of Delhi Kamal Kishore Agarwal and Pawan Agarwal. Opposing the move, the Indian Church Trust had taken shelter of the court for justice. The trust had filed a case against namely IB Das s/o Bdas, Sheela Maisi s/o R Massey, Vimla Baini d/o K Baini, Simov Das s/o P Das, Mcdonal s/o Prabhu Das and the sellers Kamal Kishore and Kishore Jain making alleging damaging and transferring the said property spread in 753 sq metre at Mussoorie. Henry Baring was the owner of the said property who bought it on June 17, 1887. He then in 1892 donated it to the Christian trust Baring Institute for their socio-religious activities. Henry Baring clearly mentioned in his affidavit that all his rights had been transferred to the trust indefinitely and none whatsoever had the right to damage, sell or transfer the property but the above mentioned party had sold off the trust property to Kamal Jain and Pawan Kumar. “When the batch reached Pangla at 4 pm from the Gala camp on their way to base camp Dharchula, 25 workers of the kisan sabha stopped them for nearly six hours. Despite all assurances from the Dharchula administration of appointing teachers, the workers did not move away from the road. After the blockage became intolerable for pilgrims, they crossed the blockade at nearly 11 pm,” said Navneet Pandey, Sub-Divisional Magistrate, Dharchula. Anant Akash, member of the secretary board of the CPM, said the public, would come under severe strain with the transport rates increasing from Re 1 to Rs 4. He requested the STA to reconsider its decision and stall the order. The students were given tips like not speeding the vehicle to save petrol, to use narrow based utensils to save cooking gas, to stop the vehicle at red lights, to use less of clutch while driving, to turn off the gas cylinder when not in use etc. A written quiz on petroleum conservation was also held in which Samar Jahan won the first prize, Vijendra Nautiyal second prize and Soniya Thapli won the third prize. PCRA has been working for the development of strategies for energy conservation and environment protection in the industrial, transport, agriculture, domestic and commercial sectors on behalf of the Ministry of Petroleum and Natural Gas, Government of India. SEWA secretary Anmol Jain, Varun Rawat, Raj Kumar Kashyap and others were present on the occasion.